This guide was created for students conducting introductory research in the area of disability law. This quick topic guide was created for students conducting introductory research in the area of disability law. While not comprehensive, the guide provides a listing of the more important current and relevant materials available, including primary and secondary sources covering the Americans with Disabilities Act of 1990 (ADA) and the ADA Amendments Act of 2008 (ADAAA). This booklet provides readers with a comprehensive analysis of the ADAAA and the Equal Employment Opportunity Commissions (EEOC) regulations implementing it. Key changes made to the ADA are discussed, with one of the most important being to the definition of disability. Citations to statutes, regulations, and illustrative cases are included, as well as a table of cases. 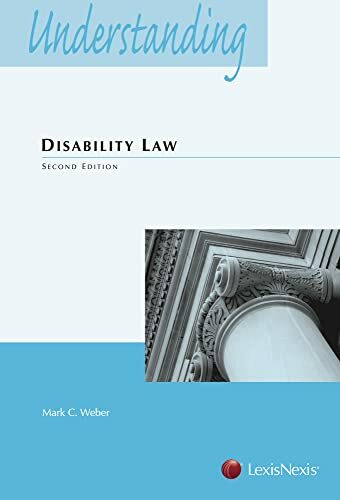 An overview of disability law, primarily the ADA, including links to related federal and state statutes, state judicial decisions, conventions and treaties, and key internet sources. An overview of the major federal laws pertaining to discrimination against people with disabilities." Covers the Americans with Disabilities Act (ADA), the ADA Amendments Act of 2008, the Rehabilitation Act, the Fair Housing Act, and the Individuals with Disabilities Education Act (IDEA). Discusses statutory and constitutional provisions. Covers leading cases on each of the major topics of disability law. Reviews laws as they relate to controversial issues.